Martin Goldstein, M.D., knows a lot about radiology. He also knows about medical education and the practice of medicine. But, before Jan. 16, he knew very little about automated external defibrillators. Now he wants everyone to learn what he learned that day. An AED and trained professionals saved Dr. Goldstein's life. He considers that Friday his lucky day -- lucky because he was stricken in a visible location on the IUPUI campus, was quickly assisted by people with medical training and was rescued by an observant IU Simon Cancer Center employee who knew just where to go to get an AED to restart Dr. Goldstein's heart. "There is no question in my mind about the importance of AEDs," Dr. Goldstein, an assistant professor, part-time, of clinical radiology and imaging science, said. "I am very glad they are being installed on the campus and I hope everyone takes the time to learn how to use one." He also thinks it is critical that people be aware of the placement of the devices in the buildings they work in and on campus in general. "These devices so frequently save lives and people can be taught how to use them," he said. "Time is of the essence with these devices and people need to be aware in advance of where they are located. What good is a live-saving device if you get it there too late?" Dr. Goldsmith credits the quick thinking of Mitch Nettleton, a practice administrator at the IU Simon Cancer Center, who ran back to the building to retrieve an AED while Ina Wilson, an IU Health nurse practitioner, and nursing student Maria Whicker, who was on her way to orientation, performed CPR. About 6 p.m. that Friday, Dr. Goldsmith had left Riley Hospital where he was teaching a radiology class to fourth-year medical students. He had crossed Michigan Street and was steps from the door to the Vermont Street garage when he collapsed. He has no recall of events after leaving the classroom but he is sure he has "four special angels" in Nettleton, Wilson, Whicker and IUPUI police officer Brian Deubner, who responded and had training in the use of AEDs. Dr. Goldsmith said he believes he was shocked two times to stabilize his cardiac rhythm and then spent two weeks in the hospital. He was one of the lucky ones; fewer than 5 percent of the nearly 350,000 people in North America who suffer sudden cardiac arrest survive. For every minute that passes between collapse and defibrillation, survival rates decrease 7 percent to 10 percent. With defibrillation, survival rates improve with a decreased survival of 3 percent to 4 percent per minute from collapse to when bystander CPR is provided. Cardiac arrest - the abrupt loss of heart function -- strikes immediately and without warning. The tell-tale signs: sudden loss of responsiveness, no normal breathing, no or irregular pulse. Campus Facilities, the IU School of Medicine and the IUPUI Police are preparing to install Philips Heartstart FRx Defibrillators in all the medical school buildings. AEDs are already in place in most of the buildings on the IUPUI campus. The AEDs will be placed in a visible and easily accessible location, health safety officer Mark Mowery said. Mowery, who is chair of the IUPUI AED Committee, said the AEDs are placed in a white metal box that hangs on the wall under a protruding sign marked "AED" for easy visibility. The life-saving devices will be located near elevator lobbies or other noticeable places. Most medical school buildings will have one AED, although larger buildings, such as the Cancer Research Institute, Research II and Walther Hall, will have AEDs on two or more floors. Mowery said the Heartstart FRx defibrillator is easy to use with clear, audible instructions. He wants faculty, staff and students to familiarize themselves with the device before they need one. An AED tutorial is available online at the IUSM Resources web site. IU School of Medicine and Polytechnic of Namibia Cytotechnology Program are collaborating on a major cause of illness and death in the African nation -- cervical cancer. Polytechnic Dean of the School of Health and Applied Sciences Sylvester Moyo, D.Phil., joined William Crabtree, Ph.D., director of the IUSM Cytotechnology Program and associate professor of cytotechnology and of pathology and laboratory medicine, and other researchers July 23 for an overview of the ongoing research and to discuss future collaborations. “Cervical cancer is the number one cause of cancer deaths for women in Africa. If our efforts are successful we will be instrumental in reversing that trend and saving many lives,” Dr. Crabtree said. The vision of Drs. Moyo and Crabtree is to address the immediate need for cytotechnologists in Namibia and the southwestern regions of Africa. The IUSM Cytotechnology Program will provide a minimum of two seats in its classes for international students from Namibia; the development of a six-month certificate program for gynecologic cytology screening at Polytechnic and to support a bachelor's degree in cytotechnology in Namibia. “Once the certificate program is in place, the IUSM Cytotechnology Program and Polytechnic Biomedical Science faculty will develop the curriculum and plan of study for a B.S. degree in cytotechnology from Polytechnic. The B.S. degree program will encompass all aspects of cytopathology including gynecologic and non-gynecologic," Dr. Crabtree said. Also participating in the one-day conference were Ian S. McIntosh, Ph.D.; Jan Aycock; John Eble, M.D., Peter Nalin, M.D., Eyas Hattab, M.D., and Marti Reeser, Ed.D. Chancellor's Professor Simon Atkinson, Ph.D., has been appointed IUPUI interim vice chancellor for research by IUPUI Chancellor-Select Nasser H. Paydar. The chair of biology at the IUPUI School of Science and an adjunct professor of medicine and of biochemistry and molecular biology at the IU School of Medicine, Dr. Atkinson's appointment is effective Aug. 16. He will serve as interim vice chancellor for up to two years while IUPUI conducts a national search for this critical position. He succeeds Kody Varahramyan, who will step down to serve as senior aide to the chancellor. Dr. Atkinson is an internationally respected National Institutes of Health-funded researcher specializing in kidney biology research. His background spans science, medicine and business and his interactions extend far beyond his core research on kidney disease, with a record of numerous scientific collaborations with investigators across campus, especially in the Herman B Wells Center for Pediatric Research at IU School of Medicine. Kurt Snyder, J.D., director of the Division of Continuing Medical Education, received the 2015 IUPUI Staff Council Outstanding New Member Award. Snyder received the annual award on Friday, July 24, at the IUPUI Staff Council Retreat. The goal of this award is to honor members who have committed time and effort to the council, in addition to being active within the greater council and their specific subcommittees. “It is an honor to receive this recognition. I am particularly grateful that the leadership at IUSM allows me to participate in such campus activities. It is great to share ideas and learn from my peers that work at the other schools on campus,” Snyder said. The IUPUI Staff Council is a campus committee of 70 staff members who represent the staff in the communication and decision-making process of the university. The council provides a channel for communication between staff, administration and faculty, promotes staff development and recommends policies that facilitate retention of highly qualified personnel. Student Financial Services has relocated from the VanNuys Medical Science Building, Room 158 to Fesler Hall, Room 224. For more information, contact Jose Espada at jespada@iupui.edu. No student should have to navigate medical school alone. The College & House Mentorship and Support Program is a new student-driven, student-led mentorship program that provides a house-based support system to improve student engagement and student wellness for all nine IU School of Medicine campuses. A team of students led by Dessi Moneva, MS4, Medical Student Council president, has developed and implemented College & House in time for the orientation of the Class of 2019; its official launch was Wednesday, Aug. 5, with a field day and cookout. “The idea for College & House started years ago, but thanks to the creativity and dedication of many students, it is finally a reality,” Moneva said. "This program offers something that all IUSM students can connect to and feel a sense of community. It’s all about living a healthy and balanced life throughout medical school." Each house features student leadership opportunities in a structure parallel to the Medical Student Council. Each region has a college leader, and each house will have one underclassman and one upperclassman representative. 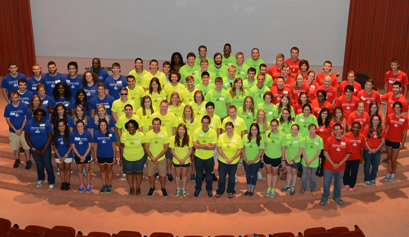 These student leaders will organize events, coordinate with existing committees such as Wellness and Peer Advising Program, and tabulate points towards the Dean’s Cup – a new award that will be given annually to the top college based on events in five categories: wellness, advising/mentoring, service, alumni and social activities. This program is supported by the Medical Student Council and aligns with the Mentorship and Advising Program (MAP). Similar learning community systems have been successfully implemented at other medical schools, including Vanderbilt, Harvard, Stanford and Northwestern universities. Click here to view the new website and learn more about College & House. Applications for house representatives will open Aug. 10. For questions, inquiries or more information about this initiative, contact MSC. Nine IU School of Medicine students have received scholarships for summer research projects conducted through the IUSM Medical Student Research Program in Academic Medicine. Students spent 12 weeks working under an IUSM mentor on research projects developed by the students. They also attended weekly seminars to learn more about the process of considering research as a future career option. SRPinAM students are second-year medical students. Faculty judges included Mervin C. Yoder, M.D., James J. Brokaw, Ph.D., MPH, Peter J. Roach, Ph.D., Rebecca J. Chan, M.D., Ph.D., Angelo A. Cardoso, M.D., Ph.D., Robert Considine, Ph.D., Harikrishna B. Nakshatri, Ph.D., Robert S. Tepper, M.D., Ph.D., Robert P. Nelson, M.D., Timothy A. Sutton, M.D., Ph.D., Barbara Kluve-Beckerman, Ph.D., and Joseph P. Bidwell, Ph.D. The judging was based on oral presentation. Criteria for selection was based on quality of science; quality of the presentation (delivery and clarity); ability to respond to questions; communication of the level of motivation/enthusiasm and ownership of the project; and clarity about the student’s own contribution versus lab’s contribution to the project. When Eric was 10, both of his parents were diagnosed with multiple sclerosis within a span of two years. From that moment on, he knew he wanted to be a doctor. On Friday, Aug. 7, Eric will receive his white coat, marking his official entry into the IU School of Medicine. Here’s Eric’s story. In 1999, my father learned that he’d been diagnosed with multiple sclerosis, a neurological disease. In 2001, my mother also learned that she’d been diagnosed with the same non-curable disease. Do you have a specialty in mind? Because of the personal first-hand experience I have in dealing with neurological disorders, I have always wanted to specialize in neurology to help other families like my own who suffer from an incurable disease that affects their lives on a daily basis. Growing up on the Northside of Indy, IU was always viewed with the utmost esteem and respect. But more than that, shadowing a physician like Dr. David Mattson over my summer breaks in Indy allowed me to really understand the level of personal instruction I’d receive as an IUSM student. What does the White Coat Ceremony mean to you? The moment my white coat is placed on my shoulders is both an end and a beginning. It’s an end to the 14-year journey to becoming a med student since my parents were first diagnosed. But, it’s the beginning of a more fulfilling journey and the beginning of a career in helping families just like my own to live better lives. What are your hobbies and interests outside of medicine? I’ve played tennis since I was five years old. I also follow Miami Hurricanes football, Chicago Cubs baseball and Indiana Pacers basketball. In 1993, Julian and his five siblings became the first surviving set of sextuplets born in the United States. After seeing the attentiveness and care of the doctors, Julian was inspired to do just the same. At the White Coat Ceremony on Friday Aug. 7, Julian will receive his coat and continue his journey toward becoming a doctor. Here’s his story. When my brother was hospitalized, the level of care demonstrated by the attending physicians initially made me interested in medicine. I also have a love for science and interacting with people, so medicine seemed like the perfect fit. From what I have observed so far, I am leaning either towards orthopedic surgery or a pediatric subspecialty. A lot of the mentors I’ve had have been affiliated with the IU School of Medicine network. I feel that this school puts great emphasis on community and on collaborating to become better students and physicians. It also aligns with my support network outside of the academic environment. I think the White Coat Ceremony symbolizes the culmination of my past accomplishments. It symbolizes the next milestone along the path to pursuing my passion in life. Outside of medicine, I enjoy running, the occasional video game, going out with friends and traveling. A graduate of Indianapolis Public Schools and a lifelong Hoosier, Shane Dorsey successfully completed IUSM’s Master of Science in Medical Science program, earned a B.A. in chemistry and will receive his white coat on Friday, Aug. 7, thereby becoming an official MS1. Shane is passionate about caring for underserved populations and providing health care for everyone – regardless of background. I grew up in an underserved area of Indianapolis and saw that there was a need for better health care in my area. I am interested in working with medically underserved populations and getting these individuals the health care they need. My mother also has multiple sclerosis, which further influenced me to pursue medicine. Right now, I’m interested in emergency medicine. I’m from Indiana and wanted to stay close to home. I also received a scholarship for my tuition. To me, the white coat represents a willingness to treat any individual in need, no matter his/her social, educational or economic status. It also exudes a sense of trustworthiness and understanding of differences. I love to read and I’m currently teaching myself Spanish. Cory J. Pitre, M.D., has been appointed director of the IU School of Medicine Transitional Year Program. Dr. Pitre’s appointment is effective Aug. 17. He is an emergency medicine physician by training and currently serves as IUSM Patient Care Competency director. Mark Seifert, Ph.D., has shifted his role as assistant dean for Curriculum in the Foundational Sciences to serve in the role of course director for gross anatomy and to lead the phase I curriculum implementation team for the human structure course. He will serve as the statewide course director for human structure when the new curriculum begins in the fall of 2016. Dr. Seifert also is a professor of anatomy and cell biology. Since joining the IU School of Medicine faculty in 1990, Dr. Seifert has focused on mentoring, researching and studying modulation of bone biology. Over the years, he has instructed thousands IUSM students in gross anatomy and will continue in his new role with oversight of the course on all nine campuses. Derron Bishop, Ph.D., the current associate dean and director of IUSM – Muncie and associate professor of physiology, has agreed to serve as the interim assistant dean for curriculum in the foundational sciences during the transition period. Dr. Bishop has served as the center director for cellular and integrative physiology in Muncie and will also be the statewide course director for the fundamentals of health and disease course when the new curriculum is launched. Kathy Peck, executive associate dean for administrative and financial services, will leave the IU School of Medicine on Sept 1. She has been named chief operating officer for the University of Virginia School of Medicine. In her newly created position, Peck will join David Wilkes’ executive team, playing a key role in strategic planning and implementation, policy development and issue management. Dr. Wilkes, former executive associate dean for research affairs at IUSM, recently was named dean of the UV School of Medicine. A reception for Peck will be held 4:30-6 p.m. Tuesday, Aug. 25, in the lobby of Fairbanks Hall. The National Institutes of Health has awarded IU School of Medicine a five-year, $4.5 million grant to create a new federally designated Indiana Diabetes Research Center, one of just 16 such centers in the country. "This award expresses the confidence of the NIH and NIDDK that we have assembled a world-class program of diabetes research at IU. We will focus on research that impacts disease," said Dr. Mirmira, who also is a professor of medicine and cellular and integrative physiology and a Herman B Wells Center for Pediatric Research scientist. Three research centers affiliated with the IU School of Medicine are among five recently awarded development funding in the IUPUI Signature Centers initiative program. “This is the eighth year that we have been running this internal grant program, and I congratulate the new centers that have been selected for funding," Kody Varahramyan, IUPUI vice chancellor for research, said. 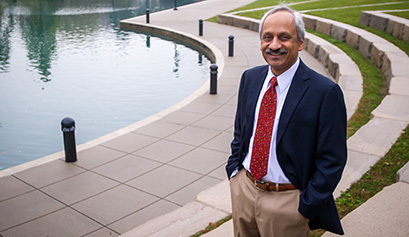 "The Signature Centers Initiative has become a key cornerstone of the IUPUI research enterprise, playing an important role in enhancing research and scholarly activity, while fostering the development of research centers that are addressing important national and global needs, and contributing to economic and social well-being," Varahramyan said. Center for Spinal Cord and Brain Injury Research, Xiao-Ming Xu, M.D., Ph.D., director, IU School of Medicine. Focus: To understand molecular mechanisms underlying traumatic spinal cord and brain injuries and to develop innovative repair strategies that can be translated to clinical treatments of these diseases in a timely and responsive fashion. Indiana Center for AIDS Research, Samir Gupta, M.D., director, IU School of Medicine. Focus: To develop internal infrastructure to facilitate novel collaborations among researchers that will lead to improving access to care for all HIV/AIDS patients; and improving retention in care and adherence to antiretroviral therapy especially for racial and sexual minorities. Center for Cachexia Research Innovation and Therapy, Teresa Zimmers, Ph.D., director, IU School of Medicine. Focus: U.S. multi-investigator cachexia (involuntary weight loss) research center will support development of interdisciplinary, multi-investigator collaborations through meetings, a research retreat and the development of a regional consortium with Ohio State University; and the center will invest in a thematic research program on cardiopulmonary effects in tobacco-associated cancer cachexias. The other two centers to receive funding are the Center for Aerial Unmanned Systems Imaging and the Institute for Product Lifecycle Innovation. The IUPUI Signature Centers initiative fosters the development of centers that are unique to IUPUI and that can lead the way in world-class research and creative activities, and make a difference in the lives of people. The initiative provides each selected center with initial funding for a period of one to three years. The centers are re-evaluated at the end of three years and if approved, receive a five-year designation as an IUPUI Signature Center. With the growth of electronic medical records, research using data from a large number of patients, known as big data studies, can provide important information that may be unattainable via clinical trials which tend to be costly, time-consuming and involve fewer patients. "This study is a perfect example of how we can learn about the previously unknown therapeutic effects of drugs from big data. In this case, big electronic medical record data are being used to answer questions that may otherwise be unanswerable," Wanzhu Tu, Ph.D., first author of the new study published online ahead of print in the Journal of General Internal Medicine, said. "Physicians now know, beyond anecdotal evidence and studies that were too small to provide definitive findings, that there is an additional benefit from a drug we often prescribe, and perhaps should be prescribing more often," said endocrinologist J. Howard Pratt, M.D., senior author of the study and professor emeritus of medicine at IU School of Medicine. The inaugural IU School of Medicine Research Rally will be held in conjunction with the Indiana CTSI Annual Meeting from 8 a.m. to 2 p.m. Friday, Sept. 11, in IUPUI’s Hine Hall Auditorium. A showcase of on-campus services available to investigators, the Research Rally will feature a field of 11 cores designed to support and expedite research projects. Attendees who have their rally logbook stamped at all 11 checkpoints will be eligible for a chance to win a Kindle Fire HDX 7. Don’t pass up this opportunity to interact with scientific service cores ready to drive your research forward. Distinguished Professor, Chancellor's Professor and Professor of Medicine Douglas K. Rex, M.D., was appointed one of the new councilors for the American Society for Gastrointestinal Endoscopy. Chandy John, M.D., M.S., Ryan White Professor of Pediatrics and professor of microbiology and immunology, received one of 11 Doris Duke Charitable Foundation Clinical Research Mentorship grants for 2015. This competitive award program supports the development of a mentoring relationship between a medical student interested in becoming a future researcher, and a clinical scientist who is a previously funded Doris Duke investigator. Dr. John previously received the 2013 Innovations in Clinical Research Award. Indra J. Das, Ph.D., professor of radiation oncology, has been named the Dr. Ramaiah Naidu Memorial Oration Award recipient for 2015 by the Association of Medical Physicists of India. The award will be presented during the 36th Annual Conference of AMPI at Trivandrum, Kerala, India, in November.